Do you like violence? The 1960s? Excessive use of the C word, the F word, the P, J, M, S and K words, along with any other swearwords known to man? Then Legend is the film for you. To be perfectly honest, very nearly 100% of the reason I went to see this movie is double Tom Hardy. I don’t believe in mythologizing and glorifying the horrifically violent actions of a pair of bullying thugs – nothing can justify their actions. The Kray twins should not be turned into “Legends”, they should be remembered as the violent criminals that they were. That said, and my position made clear, I really enjoyed this film. I mentioned that I went for Tom Hardy, and I was not disappointed. The CGI used to allow one actor to play both of the leading roles is spectacular, and it’s best shown off in a fist fight. You can see both twins’ faces, and it looks flawless. Hardy himself does a beautiful job, portraying the “sophisticated” gangster with the motive to change but an undeniable bloodlust as well as he does the barely contained psychopath. 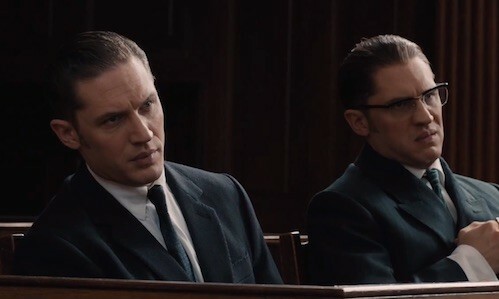 While Legend’s double Tom Hardy gimmick may be what brings the audience in, the rest of the cast not only support Hardy, but shine in their individual roles. Emily Browning – who plays Reggie Kray’s wife, Frances – beautifully portrays her character’s arc, from the young girl dazzled by glamour and falling in love, to the disillusioned wife scared of what her husband will do next. Visually, the film is breathtaking. Helgeland manages to capture the look and feel of the 60s beautifully, especially in his soundtrack, which features everyone from the Righteous Brothers to Duffy. While it is not necessarily a cheerful film, Legend is quite funny. I found myself laughing more than hiding behind my fingers. Any film about the Krays is going to contain a fair amount of violence. Legend doesn’t skim over it, but instead incorporates it into the plot completely casually, to the point that breaking someone’s nose becomes as commonplace as offering them a cigarette. While this is a bit shocking at first, it’s so normalised that the audience is desensitised to casual violence very quickly. While it’s mostly just fist-fights and pub brawls, there are a few scenes that earn the film its 18 rating. Despite these scenes, Helgeland is very careful never to show violence for the sake of violence – every scene, no matter how gory, serves a purpose in the narrative. While Legend has a strong and interesting storyline, it does have some flaws. As it depicts the life of the Kray twins, it also includes a side-plot about the police investigation into their activities. While the head of the investigation is played by Christopher Eccelston – and who doesn’t love Christopher Eccelston – it seems a little pointless. It doesn’t add much to the story, and doesn’t seem to come to any real resolution.